Many students struggle to improve their IELTS Listening score from 7.5 to 8 bands and often come up with the query – how to improve listening score in IELTS. The IELTS exam starts with the IELTS listening section followed by reading and writing. IELTS speaking test is conducted on a separate date. So the mind is fresh when test takers enter the exam hall and are well prepared to take the IELTS listening exam. This section not only assesses the IELTS listening skills but also it is a test of test taker’s concentration and range of vocabulary. So you may also need tips to improve concentration and vocabulary for IELTS listening. Test takers generally find reading and listening easier than IELTS writing or speaking. However, one cannot take these sections lightly and need to do listening practice with the help of a variety of resources. The IELTS Listening section is the same for both IELTS General Training and IELTS Academic module. It has 4 sections with 10 questions each. Each question carries one mark and there is no negative marking. The difficulty level increases as you progress with the sections. First two sections relate to a general enquiry and description of a facility while the last two sections have an educational background. It is easier to score full marks in the first two sections so be careful and doesn’t lose marks here. The main reason why test takers find it difficult to score in IELTS Listening or to improve their score in IELTS Listening is that they don’t have a good range of vocabulary. While it may take a lot of time for a person to improve the vocabulary, it is easier to develop it for first two sections of the IELTS listening test as the background of the topics is often quite familiar. Efforts should be made to make notes of the words that you don’t understand and then find meanings and synonyms of the same. It takes time but will eventually pay off. There are instances when you can solve the multiple choice questions by using the process of elimination and not by the vocabulary itself. For various tips and techniques to crack the IELTS listening test, you should take IELTS coaching from a certified IELTS trainer. There are various type of questions in the listening test like fill in the blanks, multiple choice questions (MCQ), short answer questions, matching the information and labelling the diagram or a map etc. A test taker needs to do a number and variety of IELTS practice tests to improve listening skills in English for IELTS. Identify the questions that you can easily do and the ones which are difficult to answer. If you want a good score in the IELTS tests then it is advisable to get a training from a reputed IELTS coaching institute. Listening score will be definitely improved if you are exposed to various sources to learn English. Band score will go up if you listen to various English radio and news channels, watch documentaries or TED talks. In this way you can directly listen to a native speaker and understand the accent. Do not forget to revise the answers that you have written. Why lose IELTS bands score by making mistakes while transferring the answers in the answer sheet. It is important to read the instructions carefully to write the correct answers. Check the limit of words mentioned for the fill in the blanks or short answer questions to avoid any unnecessary mistakes. Test takers should check the grammatical accuracy of the answers. Also, if the spellings of the answer are wrong then the answer would be automatically wrong. Care should be taken to write the answers clearly so that the IELTS examiner can easily read them. 10 minutes extra transfer time is given in the IELTS listening paper-based test and 2 minutes are given to check your answers in the listening section of IELTS computer-based test. 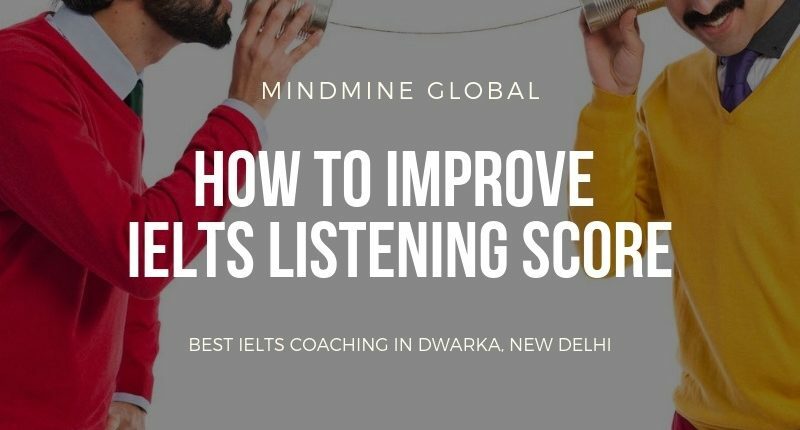 It is highly recommended that the test takers should join the best IELTS coaching in Dwarka or the best IELTS coaching in Delhi to improve the IELTS listening score from 7.5 to 8 or 9 bands. A certified faculty for IELTS can help to achieve and improve your score in a professional manner. They are experienced and understand the strength and weakness of the students and provide effective IELTS training. Doing free online coaching for IELTS from unknown sources or from unofficial resources can be a waste of time and energy. Mindmine Global by Mindmine Academy Private Limited provides the best IELTS Coaching in Dwarka. It offers both classroom and online coaching with flexible timings.